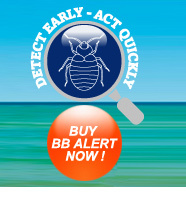 As a regular or prospective cruise passenger you may not be aware of the risk of Bed Bugs sweeping the world today. BB ALERT® is the perfect monitoring solution for cruise companies which will give you peace of mind knowing that there is a constant monitoring process in place. Whether you are a regular cruiser, an anxious cruise company professional, a concerned potential passenger, or just intrigued by the Bed Bug "plague" that is engulfing the world, we hope that you will find something of interest and value in this site. But my cruise ship's cabins are always very clean! Bed Bugs and their relationship to cleanliness and hygiene is a common misconception. Bed Bugs have no connection with the level of hygiene therefore even if your cabin is absolutely shiny clean there could still be Bed Bugs hiding in the smallest of cracks and crevices in the most inconspicuous of places. How did my cabin get Bed Bugs? Bed Bugs may also enter cabins from other connected cabins when looking for a blood meal. Unfortunately, Bed Bug infestations are often hard to spot until they have developed into a significant size. This can allow small populations to spread through conjoined cabins before control is implemented. Bed Bugs have been known to move considerable distances through pipe work and similar connections in compact structures. Can I really bring Bed Bugs back from my cruise? Yes, absolutely. The setting of a cruise ship with a high number of potential hosts and a good number of hiding places makes it a great breeding ground for Bed Bugs. The nature of Bed Bugs as great hitchhikers means that they could climb into your belongings and then travel back with you when you get home. What should I do if I suspect that I have Bed Bugs? If you suspect you have Bed Bugs then you must ensure that you isolate your belongings and place them in sealed bags. If you come across an infestation then you must contact your pest management company immediately and then contain the infestation to help ensure that it does not spread. If you are aware that Bed Bugs are present then you must make sure that the infestation does not spread. Your pest management company will advise you on the best course of action to take once they have inspected the area.